Currently, I am using Lyngdorf W210 from Tact. Here is the official description. 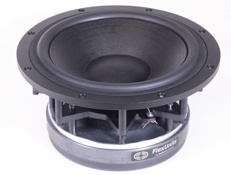 “An conventional subwoofer is only capable of reproducing the deepest bass – below say 120Hz – hence the name subwoofer. When using the Lyngdorf W210 BassDirect speaker you typically cross over to the main speakers around 400Hz – or even higher! Placing the W210 in a 2+2 system ensures that the direct sound and the first critical reflections from the floor, side and front walls all arrive simultaneously at the listening position. Compared to the traditionally delayed arrival of several low frequency reflections from a normal full range “box” loudspeaker, with a Lyngdorf bassDirect speaker there is no delay in the way the pressure builds up from e.g. a drum kick. The W210 can free up the dynamics in your system in several ways. We guarantee you that when W210 is placed in a corner, punch and power are delivered with a precision which cannot be obtained from a normal speaker system. This is only possible because of the way these speakers load the room. 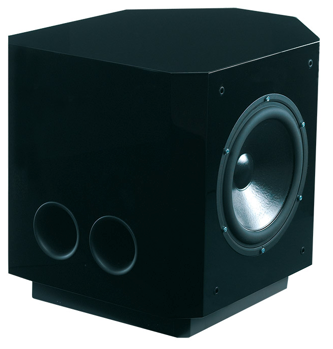 Furthermore, the corner placement increases the sensitivity of the system (it simply plays louder) which then in return reduces the need for power. 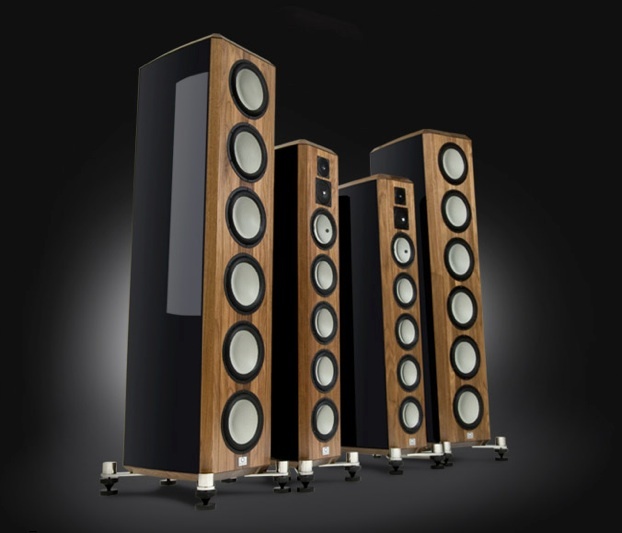 Less power means significantly less distortion and much higher headroom in your amplifier. Actually, the W210 is rarely fed with more than 5 Watts, even when playing really loud. And in this case, really loud also means very clean. Conventional subwoofers are designed with heavy cones, large magnet systems, and very poor efficiency due to the heavy moving systems. 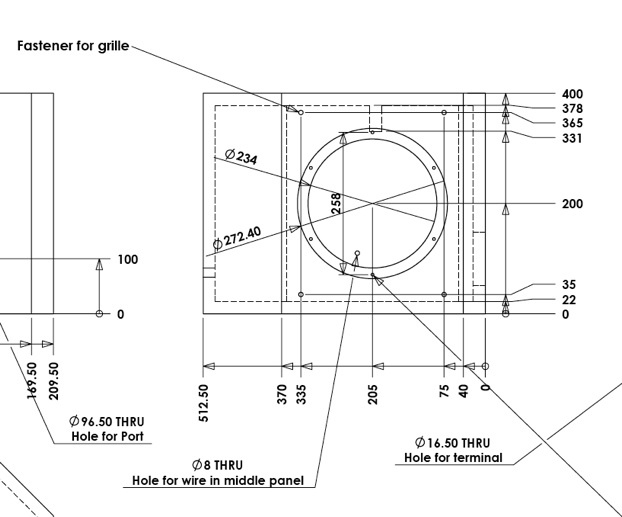 The moving mass in todays subwoofers can easily exceed several hundred grams. 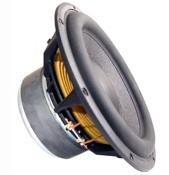 The W210 is designed in a completely different manner with a high speed lightweight driver granting a frequency response which is linear way up into the midrange area. The two 10in Vifa/ScanSpeak woofers are designed more like midrange drivers than woofers – meaning with very low moving mass which results in a high upper roll-off frequency (around 4500Hz! ), extremely quick reaction time and very high sensitivity. Actually, the impulse response is better than most midrange drivers . . . 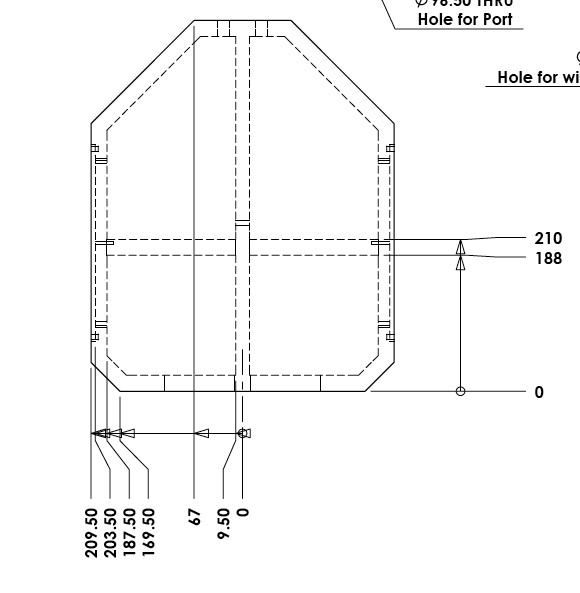 The pole piece is copper plated in the magnet gap in order to reduce eddy currents. 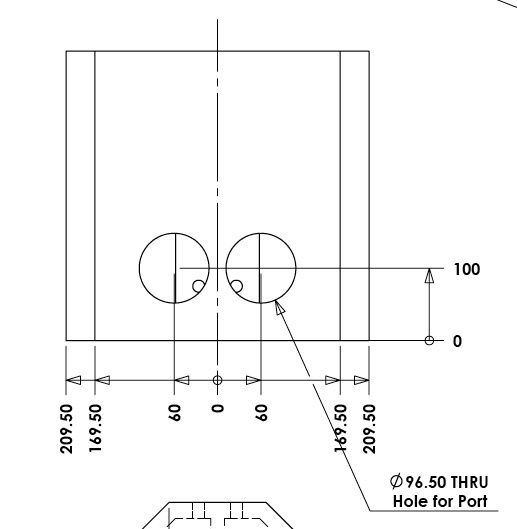 This reduces iron distortion and inductance. The result is significantly improved impulse response and reduced distortion. The cabinet is shaped to fit into the corners of a room which gives the further advantage that all surfaces of the cabinet are as small as possible. This together with the 22mm thick MDF board used for building the cabinet ensures an extremely rigid and vibration free construction. Furthermore the cabinet is divided into two separate chambers – the partition also working as an internal bracing of the cabinet. 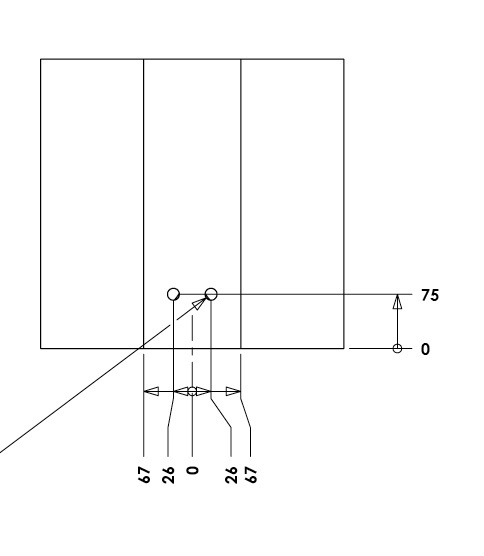 The two 10in woofers are placed horizontally opposing each other. This ensures that they “fire” towards the side and front wall ensuring optimal loading of the room. Also the placement ensures that Newton forces are reduced greatly. The movement of the two cones are always counteracting each other and thereby practically eliminating vibration. The cabinet is craftsman-manufactured in a beautiful piano-gloss finish, comprising no less than 10 layers lacquer, each polished to a deep, black, glossy finish. When I first got my W210, I connected it directly to the LFE of the AV Amp output but got nearly low sound. I have to turn up the by 15dB before I can hear reasonable sound coming from a normal subwoofer. I wonder why? When I connected to my previous Tact 2.2X and did the correction, everything is normal. Now moving on to Accourate, I again run into trouble of too little bass extension if i did not equalise/linearize the W210. What is going on??? Now, it becomes clear that if you connect the W210 with a standard amp and with a normal line level output, you won’t get much sound. You really need to implement Linkwitz transform to take the benefit of the W210. Both Tact and Accourate should allow you to do that, only limited by the cone excursion. In the picture shown above, you can see the red line represents cone excursion. 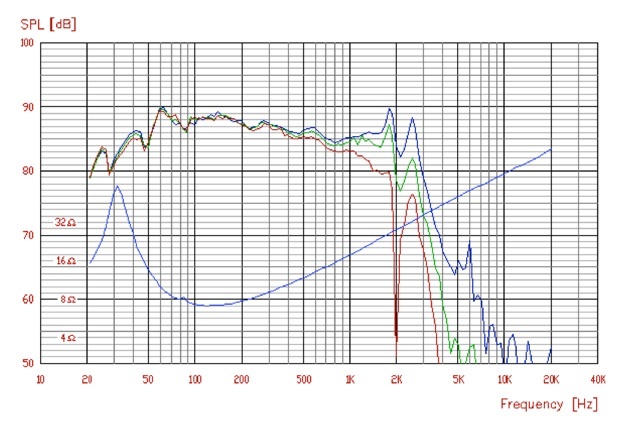 It is clear that because the way the ported frequency is set, anything below 20Hz is practically impossible to achieve. 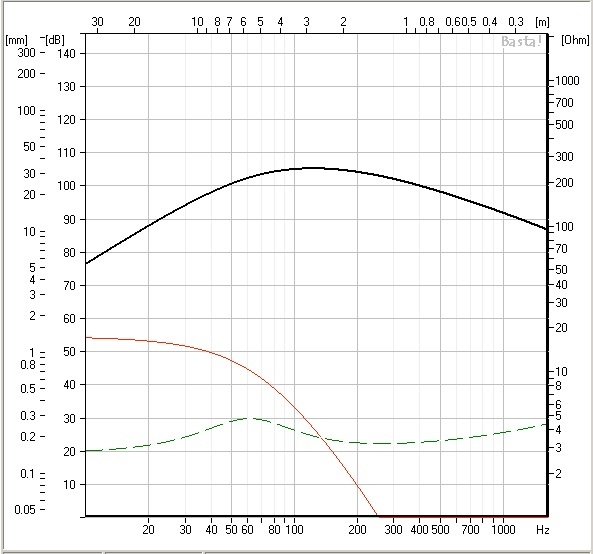 If you use EQ to force the driver to achieve this level of SPL, the cone just do crazy and crack. I have tried some vinyl rip with subsonic signal and the driver clear hit the boundary. 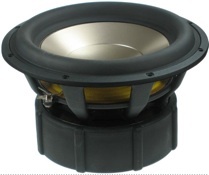 Luckily, Acourate incorporate subsonic filter which allows you to keep the subwoofer in good condition. Interesting enough if you look that the technical specifications listed on their web page, it is an active system as well crossing over at the exact frequency as my system – 100hz. 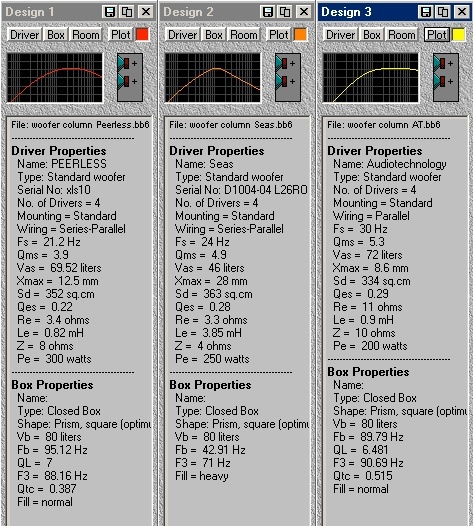 If you do the simulation with the size of the cabinet and the published spec of accuton drivers, it is not hard to conclude that they are using LT transform to achieve a low frequency range as well. The only area that surprised me is the use of bass reflex design. LT: 10Hz, Target Q = 0.3. At 20Hz, still within xmax at 15 Hz, excursion is about 10mm, still safe. All these were simulated using 80L box. I use 2 methods to do that. First one is equivalent to a LKWTZ Transform ( mínimum phase target), second one is ( close to ) linear phase target, much better imho. 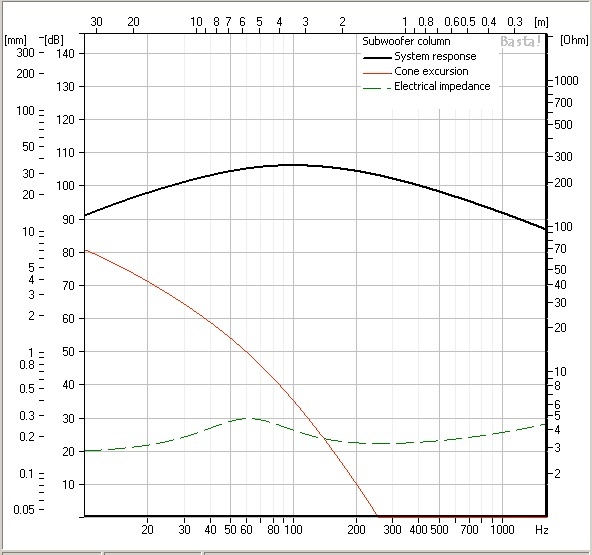 Take closed miked measurement of the subwoofer and load response in Acourate as Curve 1. 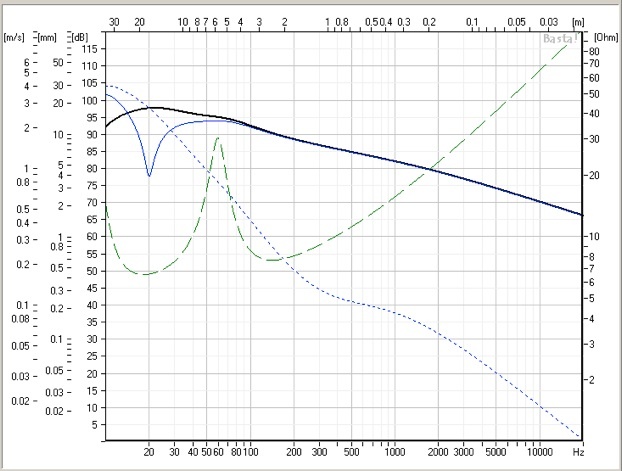 Apply some treatment to smooth the curve and extract mínimum phase below and above points to be determined visually. 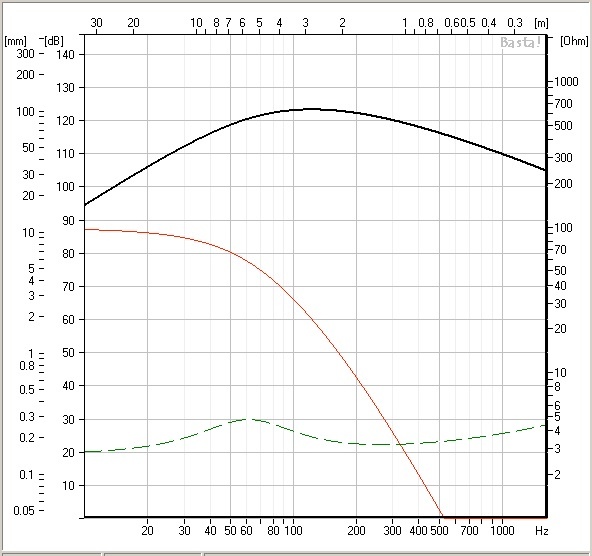 Should result as a textbook 2º order highpass with 12db/oct constant slope,and flat bandpass response. Generate your high pass target ( IIR Filter) as curve 2. Generate Amplitude Difference ( Curv2 – Curv1) as Curve 3. Save Curve 3 as impulse file needed for JRIVER. 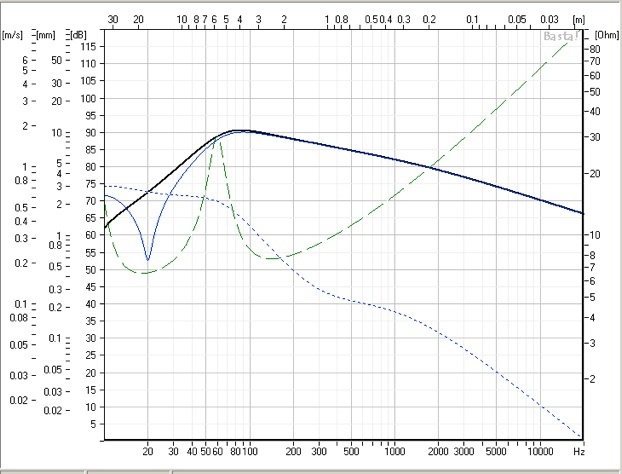 Apply treatment to smooth the curve and extract mínimum phase below and above points to be determined visually. Should result as a textbook 2º order highpass with 12db/oct constant slope,and flat bandpass response. 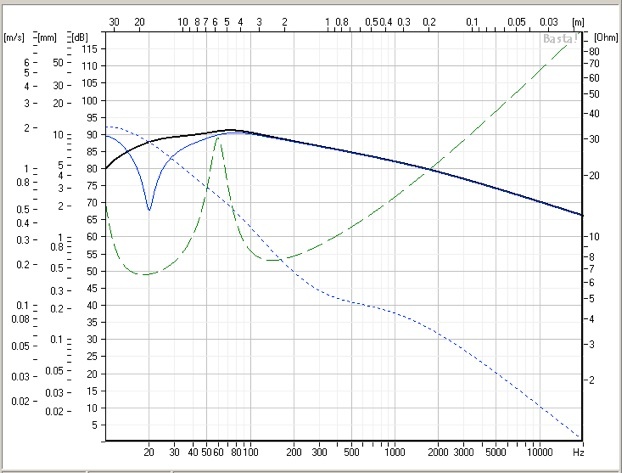 Generate a “crazy” 5hz/Q-1 high pass target ( IIR Filter) as curve 2. Generate Amplitude Difference ( Curv2 – Curv1) as Curve 3. 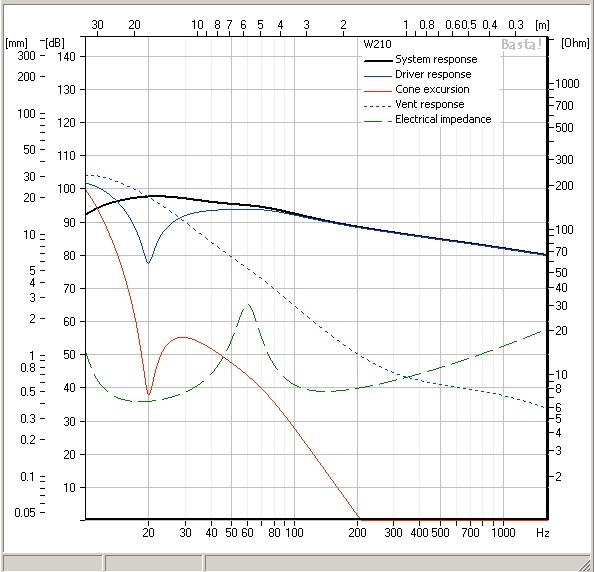 Of course this correction is not usable directly due to excessive boost at the low end and we don’t need 5hz cutoff, but the group delay is now close to linear phase. Generate your real IIR-Filter target as Curve 4 and extract Linear Phase in Curve 5. Convolution of Curve 3 * Curve 5 as Curve 6. Save Curve 6 as impulse file needed for JRIVER. The second method is the one i use with JRIVER since this player corrects the latency due to linear phase correction while playing video and avoids lip-sync issues.